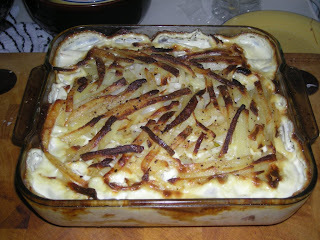 This is a classic Swedish dish that can be enjoyed hot or cold. It's a given on any self respecting Christmas smorgasbord. Lots of people react to the anchovies but they 'disappear' in the dish and don't get noticed at all. Preheat the oven to 200c/400f/Gas Mark 6. Generously grease a ovensafe dish with butter. Cut each anchovy fillet into four or more pieces. 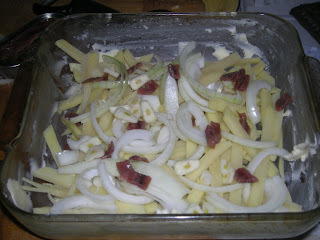 Layer the potatoes, onions, garlic and anchovies in the dish, ending with a layer of potatoes. Make sure to season each layer with pepper. Pour half of the cream over the top. 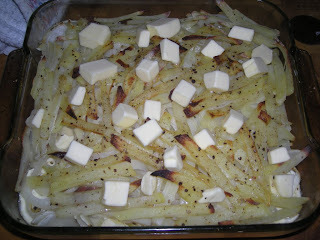 Bake in the preheated oven for 35 - 40 minutes, our until the potatoes are just colored. Then pour over the remaining cream and add the butter on top. 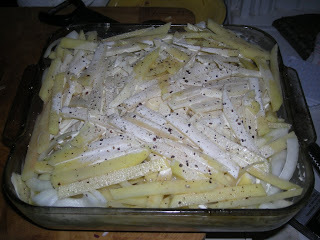 Bake for a further 20 - 25 minutes, or until the topping is golden and tender. 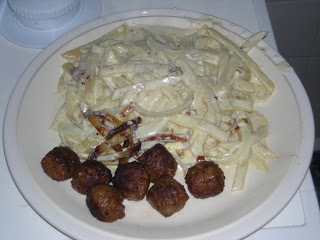 Plated, together with some Swedish meatballs. Delicious! Because they leave behind a nice and salty taste to the dish.